As Sudan prepares to divide into two countries, plans are already under way to help the South develop its substantial oil reserves. Unless there is a major mishap, 2011 will see the emergence of a new nation state in Africa. The Republic of South Sudan will come into being on July 9 following January’s referendum, in which close to 99% of its predominantly Christian and animist voters opted for independence from Khartoum and Muslim-dominated northern Sudan. The new republic is oil-rich, pumping out some 85% of the old Sudan’s total production, which, at around 500,000 barrels per day, is the third largest in sub-Saharan Africa. Independence is likely to hasten closer political and economic ties with its East African neighbors, especially Uganda, Kenya and Ethiopia. “Cross-border trade with southern Sudan is already driving demand in Uganda,” says Razia Khan, head of regional research, Africa, at Standard Chartered Bank. Over the longer term she expects massive spending on infrastructure, new roads and possibly oil pipelines to the sea. Kenya is already building a new deepwater port and logistics center at Lamu, which will be the terminus of a planned new oil pipeline from South Sudan. That will take time—at least four years for a pipeline to Lamu, less for a smaller one linking South Sudan with oilfields in Uganda, according to Roger Middleton, a consultant researcher at the London-based thinktank Chatham House. “Meanwhile, it’s in the interests of both [North and South Sudan] to abide by the roughly 50/50 agreed split on revenues and keep the oil flowing down existing pipelines to Port Sudan on the Red Sea,” he points out. Despite its oil wealth, more than 90% of its people live on less than a dollar a day, giving South Sudan the unenviable distinction of being among the poorest countries in the world. Sudan also has substantial international debt and, in the wake of the decision to split, the South and North have to quickly come to an agreement over how they will divide responsibility for it. It helps that South Sudan will be joining a fast-growing regional economy. “East Africa’s economies have been growing at between 6% and 10%, and we expect that to continue over the next decade,” says Stephen Bailey-Smith, head of research for Africa at Johannesburg-based Standard Bank. Ethiopia is expected to grow by 9.4% this year according to the latest UN report, on the back of high commodities prices and a construction boom. The IMF expects all the region’s economies will see robust growth in 2011, with Tanzania’s expanding by 6.7% and Kenya’s economy achieving 5.8% growth. Bailey-Smith believes the main economies in the region are now better managed than at any time since they achieved independence. “Current accounts are sustainable; fiscal deficits manageable. Moreover, Kenya, Tanzania and Uganda are all reasonably well-diversified economies and with their emerging middle class will progress rapidly,” he explains. Rapid urbanization and the shift of rural populations from self-sufficiency toward becoming consumers of mass-produced goods are two of the main drivers of economic change. A succession of oil and gas discoveries may soon transform the region from a net energy importer to a major exporter. Sudan has five billion proven barrels of oil, and Ethiopia has some 880 billion cubic feet of gas—reserves untouched so far because most are in the politically unstable Ogaden region. The Lake Albert region of Uganda holds some 2.3 billion barrels of oil, according to leading player Tullow Oil. 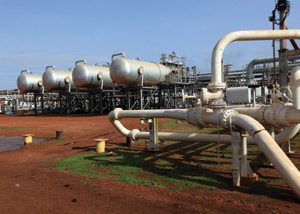 Production there is being held back because of ongoing negotiations with the Ugandan government over back taxes it holds due from Heritage Oil, whose rights Tullow has since bought for $1.45 billion. Andrew Cochran, CEO of the UK-based exploration company Dominion Petroleum, which holds stakes in licenses covering most of undrilled Lake Edward on both sides of the Uganda–Democratic Republic of Congo border, says that region’s geological similarities to the Lake Albert finds suggest it has huge potential. Brian Hall, CEO of the London AIM-listed explorer Aminex, which has had two gas discoveries in Tanzania’s shallow coastal margin, points out that exploration of the region’s coast is still in the early stages, with only 41 wells drilled so far. Hall predicts there will be substantial new discoveries beyond the 230 billion cubic feet of proven gas reserves. Bailey-Smith points out, though, that underdeveloped infrastructure is also hindering development of the consumer sector in the region: “Infrastructure spending—on pipelines, roads, rail, energy and water supply—has been woefully inadequate and must be increased to enable current levels of growth to continue,” he explains. Another threat to growth across the region is rising inflation. “Food and energy costs make up more of the inflation basket in Africa,” observes Bailey-Smith, “so we expect to see inflation rise.” However, with the region’s central banks apparently willing to raise interest rates if necessary, inflation should be containable in the longer term. “In southern Sudan,” says Chatham House research consultant Roger Middleton, “fixed-line telecommunications are virtually nonexistent. Mobile coverage in the capital, Juba, is good, with both Sudanese and Ugandan service providers. Otherwise, it’s starting from scratch.” This, he believes, presents an opportunity for mobile-network providers, especially since neighboring Kenya has led the way in mobile-phone penetration. It is Kenya’s rapid development of banking by mobile phone that offers the best model for South Sudan, where there are precious few bank branches to serve its population of 8.2 million. “Kenya has been innovative in the mass mobilization of deposits and telephone banking,” says Standard Chartered’s head of regional research for Africa, Razia Khan. The development of phone-based financial services in Kenya has been helped by accommodating regulation by the central bank and unprecedented demand from millions of previously unbanked citizens. Local mobile-network operator Safaricom paved the way with its mobile-phone-based money transfer service, M-Pesa, whose millions of customers use it to store and transfer money or pay utility bills. Last year it teamed up with Equity Bank to provide a new service, M-Kesho, which allows customers to access bank accounts directly. Other mobile operators such as Airtel and Telkom Orange have entered the mobile-banking fray. “Internet and mobile-phone banking has opened up a whole new marketplace,” says Standard Bank’s Bailey-Smith. Whether this is transferable to other countries in the region, or whether it depends on Kenya’s unique regulatory regime and rapid urbanization, is the question that telecoms operators and banks must decide before rolling it out further.